Ben, Anthem and Nikki are inseparable best friends. In the back drop of New Orleans a gigantic mystery arises when Nikki and her family go missing one night without warning. Anthem and Ben go on with life, struggling with the nightmare that is a missing lover, a missing friend. The story takes a while to get started due to the heavy nature of the material. We learn about the friendships and relationships of the characters involved which develops a decent background and emotional basis for the book. Once Marshall is ready to wreak revenge on Nikki after she went missing years ago at the end of high school, the book gets moving. 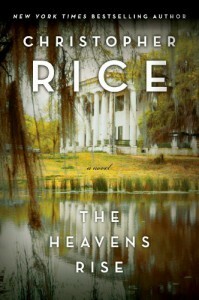 Christopher Rice is a talented author, and the story compelling. There are many twists surrounding the mystery of Nikki’s disappearance and a swamp named “Elysium”. The small swamp puddle harbours a secret as well, melding with Marshall’s vicious violent tendencies to create a chilling horror novel that gives as much action as it does intrigue. All of this said, I found the premise of the book completely unrealistic. A set of microbes that live in a person’s brain and change the brain somehow? This is difficult, but with the rare brain eating omeba in the States making news headlines ill take it with a grain of salt. The fact that many main characters are willing to subject themselves to the parasite was difficult to believe. Furthermore, when “driving” a person, if you have any emotional attachment you can turn them into “mind monsters”. I stopped really trying to believe the book was attempting to be realistic at this point. It’s an interesting idea, and definetly made my creeper meter with the parasites and mind control. The Mind Monsters however, detracted from the book. It wasn’t creepy, just strange – especially when you think over what happened to Anthem. His final form ruined the ending for me, just saying. In the end, I say two stars. Believable, Chilling and Original. It was a good read that started off slow, picked up speed and lost it a little by the end.